If the thought of being out in the wilderness, with out phone service, electricity and other creature comforts, you’re not alone! While camping can be a fun and relaxing experience most of us would prefer staying in a luxury hotel rather than a tent being attacked by possums. Enter glamping. When you mix the wonders of outdoors with the luxury of hotel suites you have a recipe for a great holiday. That’s where glamping comes in- the perfect way to get the best of both worlds. Luckily New Zealand has a few gorgeous sites for glamping scattered around. These are perfect for anniversaries or relaxing weekends away. Here’s our favourite spots in New Zealand to get your glamp on. Castaways Glam Camping out at Kariotahi Beach is the perfect weekend escape from the city. The site is in the perfect location for watching sunsets over the beach and star gazing. This site has everything you’d need with a king sized bed, central heating and the amazing outdoor baths. Plus you get treated to dinner and breakfast from the Castaways resort restaurant. This adorable site is located in Canterbury and it’s so so cute. It’s tucked into the hills, so it’s great if you’re wanting to get away from it all and spend your time walking or biking the countryside. The tents themselves are very cute and totally Instagram worthy. The Round tent in Raglan is another great glamping spot. You get to stay in a super roomy round tent with all the at home comforts. Plus there’s an outdoor bath that kind of looks like something out of a sci-fi novel. There’s even an outdoor fire pit so you can roast some marshmallows for that real camping experience. It’s hard to believe that this room is inside a tent! This glamping site in Northland is a definite must. 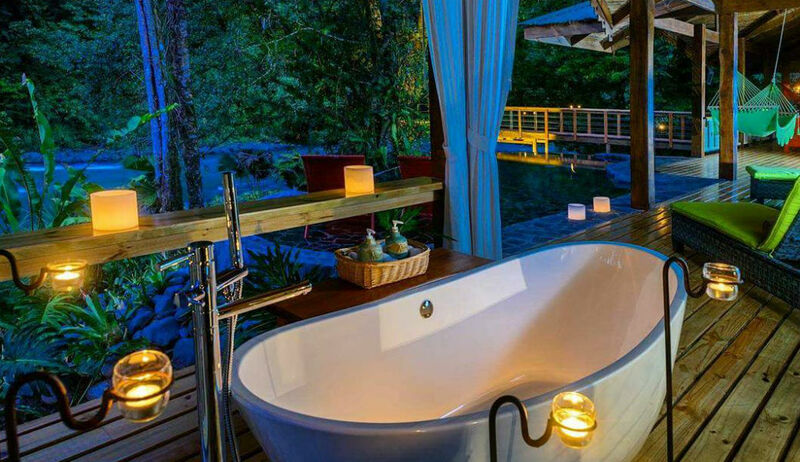 There’s an outdoor bath grotto area nestled in the forest. The location of this site is great as it’s set in a typical New Zealand forest with a running river next to it.